It’s always good to check out a favourite show especially if you haven’t seen it in a while. There are some that may not meet exactly up to my expectations such as last week with The Avengers….but that is a one-off from a usually excellent series. When it comes to All Creatures Great & Small I know that I am going to get a great episode. This is especially true when I pick an episode between Series 1-3. I know I am not alone with fellow lovers of television viewing where there are special times during a year where I think certain series are really fun to watch more than other time a year. Usually this can be associated with a memory that happened at the time of watching something special for the first time. Some examples for me of watching Hartnell and Pertwee episodes of Doctor Who are a ton of fun in the summer. The same goes for watching the Hammer film of Quatermass 2. I love watching it in the summer and maybe that is because it seemed like summer in the film. As far as watching Hartnell and Pertwee episodes in the summer probably goes back to when I was working on the convention Polaris Con II in the summer of 1989 and Hartnell stories were shown on one channel and Pertwee on another. Classic Doctor Who episodes on 2 separate channels! Who would have thought it? It’s just the same as many fans in the UK would prefer new Doctor Who to be shown in the fall/winter because it is darker at that time and adds to the atmosphere of the stories. When I watch All Creatures Great & Small, I prefer to watch it in the Fall, Sunday evenings with a Sunday evening style dinner to it. How odd is that? Probably quite odd. 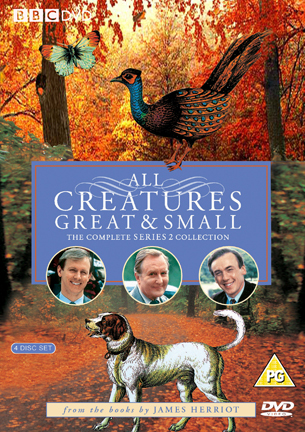 When I started to watch All Creatures Great & Small on KTCA in the mid-1980s, the series was shown on Sunday evenings, maybe around 5pm or so. From my memory, a lot of the episodes shot looked like it was Fall, of course the memory may have cheated a little bit too. Where the nice big Sunday dinner came from, I don’t know. Perhaps it was from seeing all those scenes in the series where Mrs. Hall brought nice big dinners and breakfast meals for James and the Farnon brothers. One thing I do know is that even though I may prefer to watch this in the Fall, these episode can be viewed at any time of the year….for example, right now. All Creatures Great & Small is a series that have a couple of overarching storylines in the episode but has many smaller stories that run throughout it. I know this isn’t any different than any other series but for some reason it is always much more obvious here. 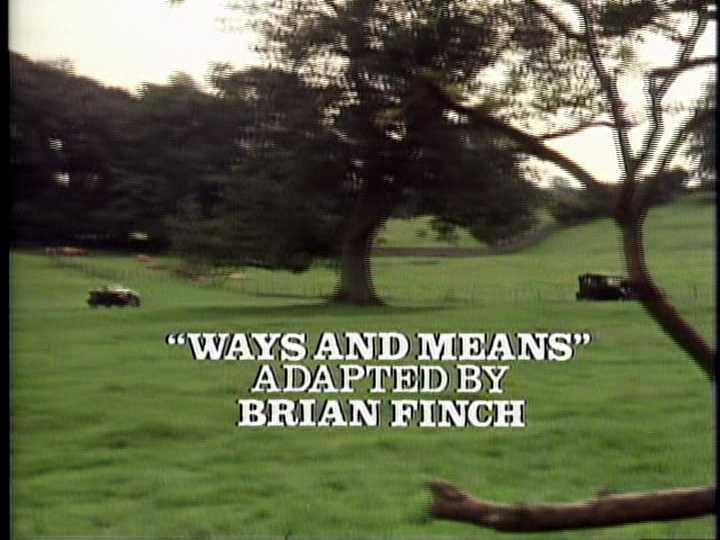 Ways and Means is really a Tristan story which is a nice change. Furthermore, it is not an episode where he gets into a lot of trouble and someone has to bail him out or he is being childish and is up to no good. We see a side to Tristan I do not recall seeing very often. He is smitten for Alice McTavish. 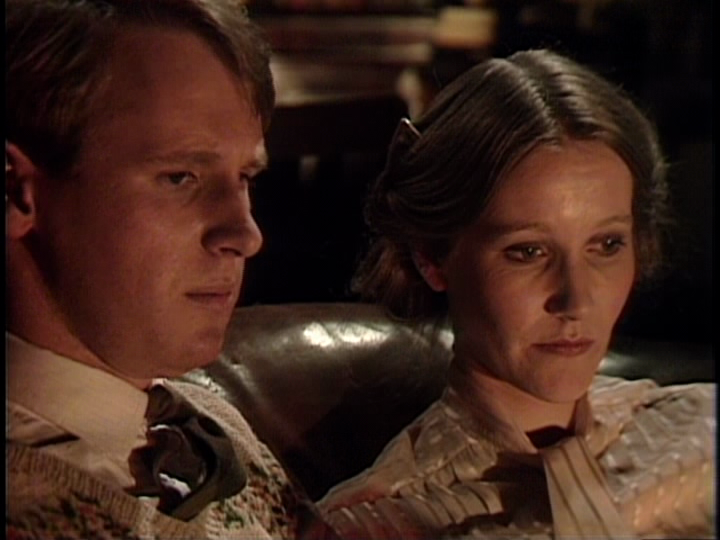 Alice turned up in the previous episode Puppy Love and in this episode we find out that her father had died and Tristan invites her down to Darrowby to stay with them for a couple of days. Of course from the very start, Siegfried is goading him. From the start of the episode Tristan is waiting for a letter from Alice. She hasn’t written to him in some time. Siegfried gets to the post first, spots the letter and takes it. All of this just to rile up Tristan. Finally, Siegfried gives Tristan the letter. Those two brothers fight a lot but when it comes down to them supporting each other, their bond is strong. As soon as Tristan tells Siegfried that Alice’s father had passed away, Siegfried does not hesitate to tell him to call Alice up in Glasgow. Now, I am assuming that would have been pretty expensive back in the 1930s. Yet, Siegfried was adamant that Tristan call her. Even when Tristan checks to see if Alice could come down to Darrowby, Siegfried is completely sympathetic to Tristan and allows Alice to stay. This really is a great story for Tristan and is also another fine example of how All Creatures Great & Small balances light humour and drama. At the beginning of the episode, we get reacquainted with Mrs. Bond the cat lady. She loves cats and we see her in the Series 2 opener Cats and Dogs. She is not all that enamored with Tristan as he caused a considerable amount of damage at her house trying to get one of her mean cats. She brings in her cat named “7 times 3” and it is found out that he has a serious disease. James and Tristan give Mrs. Bond some medicine. It is funny because James and Tristan obviously find Mrs. Bond very strange. She doesn’t have a ton of emotion, her husband even less, yet she adores cats and never stops talking about them. She is very leery of Tristan, especially after they last met. So she is a little unhappy when “7 times 3” gets worse and Tristan has to go out to her house to look at him. He brings Alice with him. With this series, when there is comedy there is also drama. It wouldn’t be an episode of All Creatures Great & Small if at least one animal didn’t die. Unfortunately, “7 times 3” has gotten worse and needs to be put down. After Tristan does that he is told some kittens Mrs. Bond has also may have that same disease. They do. If anyone would ever wonder if Tristan really wanted to be a vet just needs to watch this scene. His imagination fires up wanting to save the kittens. He remembers a very new experimental medicine that just went on the market a day or so ago. So new that James didn’t even know about it. He promises to check it out. Eventually, his plan saves the kitten’s lives. No matter how amusing or eccentric Mrs. Bond may have been in the series, I don’t think anyone who ever had a cat they adored could not help feel sorry for her. After Tristan and Alice leave, Mrs. Bond quietly picks up the dead “7 times 3” and just holds him. My heart just goes out to her and I know I did the exact same thing when I put my beautiful Davey to sleep in February. It’s important that scenes like those are shown. It’s quiet and reflective. From the very start of Series 2, there is the looming threat of war. This is the late 1930s. The rumblings of Germany are getting heavy. Talk of war is escalating. I love how the series has the threat of war and the contradiction of this talk happening in beautiful peaceful countryside. I suppose one could forgive and understand Tristan’s belief that there would be no war. He explains this to Alice as he talks with her about possibly going back to Glasgow with her. He says it in a simple innocent child-like way. He even tells Siegfried that he wants to move to Glasgow and marry Alice. Siegfried tries to talk some sense into him but is it sense or is Siegfried being a little selfish? It is unclear, at least to me, what Siegfried true intentions were yet ultimately it was probably a smart thing that Tristan stayed behind. Alice overheard their conversation about Tristan wanting to marry her. Who couldn’t, they were yelling! She gently let Tristan know that she didn’t want marriage right now. Tristan took her to her bus and they say their farewells. We never see Alice in the series again. Usually the episodes end on a positive note but we end this episode with Tristan returning to the practice while big brother pats him on the back as they all try to get back to normality. 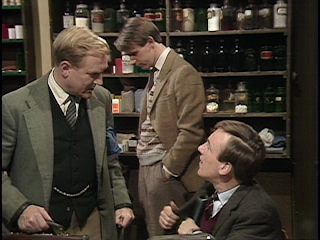 Contrary to what I wrote so far, James Herriot is in this episode. His wife Helen volunteered him to speak to the local youth group. James hates to publicly speak and Siegfried was able to give him some pointers. This included practice, practice, practice. James would practice in their Practice (so to speak) speaking in various tones from conversational, humour, or just blunt seriousness just trying to get the right tone to open his speech. Of course he turns around to see Mrs. Hall staring at him and she slowly backs out of the room not sure what got into him. The best is when James and Siegfried go to a famer where James needs to administer something to a dog. The farmer leads James to the room where the Dog is with her puppies. Since the farmer needed to leave to get some water, James felt this was a great opportunity to practice more of his speech to the dogs. The tone he starts the speech of was so loud that it scared the dog into thinking James was attacking her pups. The dog becomes almost rabid and really starts going after James who tries to leave the room but pulls off the door handle and is locked into the room with the furious dog. Meanwhile, as you can hear the constant barking of the dog outside, the farmer passes by Siegfried who is having his lunch at the car waiting for James and offers the farmer a glass of wine. So while James is desperately trying to get away from the attacking dog in the locked room, the farmer who could help him is having a leisurely glass of wine with Siegfried! Eventually James gives his speech to the Youth Club who heckles him. They didn’t care to know about the MRCBS at all. Although this episode focused more around Tristan, James is always such an endearing character. 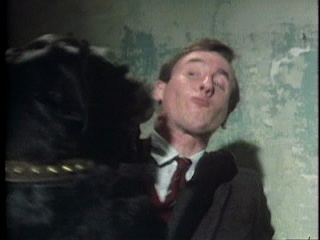 I could not imagine anyone else in this role other than Christopher Timothy. Christopher brings such warmth, patience and good humour to the role. James rarely complains about anything and does a good job of keeping his wits about him. At the beginning of the episode, Siegfried is driving with James in James’ car. James tells Siegfried that the brakes are not great in the car. Siegfried doesn’t listen and pretty much loses control of the car as he drives through all areas at accelerated speed since Siegfried can’t slow down. Siegfried looks at James and tells him that it would be a good idea if James would lets him know when the brakes go bad and not let leave it for him to find out for himself. James just smiles and nods. James also has to put up with the likes of Mr. Biggins. No matter what James says to try to help Biggins, Biggins always makes everything difficult. This is only one a few times that James loses his temper with Biggins and that is only because James was out all night with a difficult calf birthing and he didn’t yet have his breakfast. Biggins is a great example of some of the great characters the series has brought to us over the years. Biggins is almost the villain of the series in the vaguest sense. He is the one that doesn’t want to pay, won’t pay, and questions everything the vets do. James could tell him on a sunny day about how sunny it was and Biggins would tell him it wasn’t sunny at all. Helen is in this episode played by Carol Drinkwater. Nothing against Lynda Bellingham who played Helen from Series 4-7, I do prefer Carol. Carol is very fresh and fits into nicely of the time period of the 1930s. She plays off of Christopher’s James very well. I think they toned down the character of Helen quite a bit by the time Lynda got to play it and it wasn’t even the same character to me anymore. Of course, one character who always stands out is Mrs. Hall. Even though she didn’t have a lot to do in this episode, she is great. She is just a loveable kind character and was hugely missed from later episodes. In a previous article about the series, I mentioned how Series 1-3 is my favourite from the whole series. I know I am not alone in this assessment. The series has an energy to it that is not there when the series returns in Series 4. I think the upcoming threat of World War II brings a kind of edginess to the narrative of the series where there really is nothing like that when the series returned as a full series in 1988. One possible reason is that the director pool is very different for the first 3 series. This episode was directed by Christopher Barry. Funny and absurd moments such as the dog going crazy from James reading him the speech is missing when the series returned. When the series returns, it just tells the story (in a very competent way) just misses some of those specials moments that really makes this series All Creatures Great & Small. Next week: For the third time since the start of 2012 I will be writing about a series I am not a huge fan of but warming up to more and more. I look at Blake’s 7 and the episode is Trial. What can I say that has not already been said? ACGS is one of my most favorite shows, and just reading the article makes me want to listen to the theme. Ahhh, wonderful! "Piano Parchment" by Johnny Pearson - it just fits the show and creates the mood right from the opneing bars, and later versions of it just don't work quite as well as the original. Of course, the same is for the first thre series of ACGS - they are the cream, while the later series pale in comparison. Not to say that they are bad, since even a second-rate SCGS episode is still first-rate television. 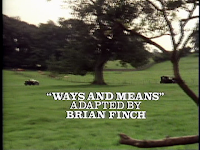 Anyway, the first three series had it all - the correct version of the theme and opening credits, the correct casting of Carol Drinkwater, a distinct (and belssed) lack of the later Herriot children and a badger-loving Calum Buchanan. I could go on but I won't. Anywho, I really want to watch ACGS again, but I am still working my way through The Avengers (just a few episodes into series 4 and already the changes from series 1-3 are huge!). Perhaps I will watch some once I bid adieu to Cathy Gale, Emma Peel and Tara King. I decided to watch Name of the Game today since James Grout passed away. He played Granville and multiple episodes. One of my favourite characters. Did you end up getting the complete boxset of The Avengers? I opted to get the individual releases. I already had the series 2(+1) set, and the word on the interwebs that the packaging of the complete set was subpar. Cost me about the same, and the only (very minor) hassle was getting replacements for two of the series 6 discs. 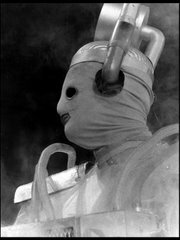 Just watched The Cybernauts today, and so far series 4 has been fun, although a drastic departure in style and tone from the previous series. Good stuff all around! To be honest, if I did pick up the rest of the Optimum sets, I would have have gone for the individual sets too even if more expensive. They are sturdy and look much nicer. I hate massive "Complete Collections"